Joseph Uzumcu is Adelaide's premium menswear and accessories store. Joseph knows the feeling of putting on beautiful clothing is a wonderful experience for men of all ages. He has been in the clothing industry for 3 decades. He started out buying fabric and making up exclusive designs for men and opened his Metro store in the late eighties. In the early nineties, he consolidated his stores from Sydney, the Metro, and Rundle Street to his beautiful establishment at Gawler Place where he thrives today. A second city store in Rundle Arcade also offers an extensive range of imported suits and accessories for hire. Joseph’s suits for hire are made from the same quality fabrics that they select for their clients when purchasing a custom made suit. These contemporary suits are designed to provide elegance, style, and comfort. The simply exquisite fabrics that are used, the range and diversity of the clothing, the product knowledge that Joseph and his team have and so freely share with clients is just phenomenal. 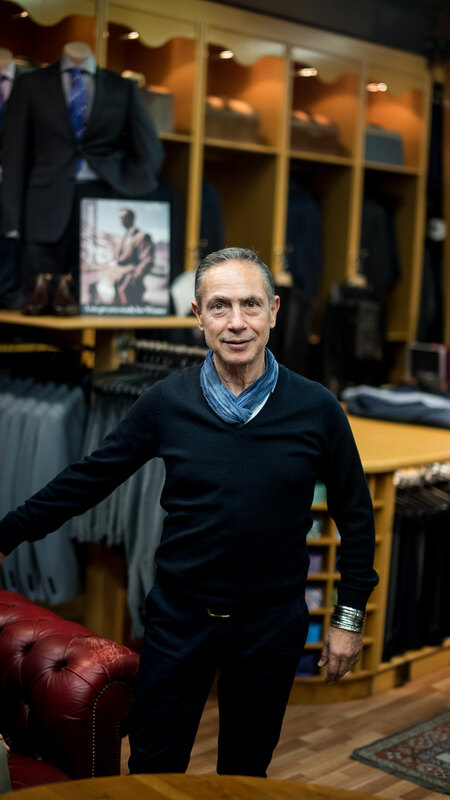 The European style and atmosphere that fills his store in Gawler Place will take men of all ages to one of the finest selections of attire and accessories in this country. I am really happy with the suit that I purchased, the fit was perfect and the alterations were done very fast. The Gawler place store has everything and it was very convenient as I did not have to go anywhere else to purchase my shirt and shoes for the event. Joseph even made my wife happy as he asked the resident tailor Raj to create a bow-tie from the same material as her gown. Joseph treats every customer as a friend and his team’s service was first-class. Really good staff and overall experience. Suits were perfect and felt great on the day. Suits were amazing quality. Joe and team made this process effortless. Literally effortless with Joe taking one look at my husband and pulling all the correct sizes. Nothing was too much for them abd the boys looked dapper on the day. Hi Joseph and staff, thank you so much for the amazing suits you made for our October wedding! We got so many comments about the quality and look of suits! We have recommended you to all our friends!